The Crimson-bellied Conure engages in geophagy (eating of soil) at clay licks. Both adults partly green in colour; brown breast with pale off-white and dark brown barring; yellow/green cheeks, turning to blue on lower cheeks; blue collar around hindneck which varies with each bird; red bend of wing, lesser underwing coverts and abdomen; blue thighs to tail coverts; brown/red tail. Bill brown/grey. Eye ring bare and white. Eye dark brown. Green lower breast and abdomen. Bill horn in colour with pale grey at base. Calls made in flight are shrill. Aviary or suspended enclosure minimum length 2m (6.5 ft). Fruits such as: apple, pears, oranges, bananas, pomegranate, cactus fruits, forming about 30 percent of the diet; vegetables such as: carrots, celery, green beans, peas in the pod; fresh corn, green leaves such as: Swiss chard, lettuce, dandelion, chickweed, sowthistle; spray millet; seed mix such as: canary, millet and smaller amounts of buckwheat, oats, safflower and a little hemp; limited soaked and sprouted sunflower; cooked beans and pulses, boiled maize, and complete pellet. Are avid chewers so provide plenty of bird-safe, unsprayed flowering, fir, willow, pine, elder or saskatoon branches, wooden block toys, vegetable tanned leather toys. Provide ladders, swings, ropes; noise-makers, push and pull toys, foraging/puzzle toys. Also enjoys bathing so provide overhead misters or shallow water bowls. Vertical box 20cm x 20cm x 70cm (8 x 8 x 30 in). This species is possibly declining due to loss of habitat. Also susceptible to hunting. Amazon River basin in N Brazil and NE Bolivia. Found up to 600m (1968 ft) in lowland terre firme tropical rainforest, forest edge, clearings and secondary growth forest. Feeds on catkins, figs and flowers, and fruits of Trema micrantha at forest margins, Tetragastris altissima, Goupia glabra, Alchornea discolor, and others. 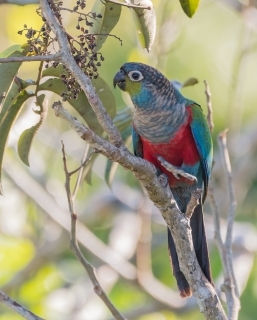 Seen in small flocks and occasionally in mixed groups with Painted Conures (Pyrrhura picta) and Golden-winged Parakeets (Brotogeris chrysopterus). Often seen descending to rivers and creeks to bathe and drink. 4-6 eggs, 25 x 20mm (1.0 x 0.8 in).